With the Florida state legislature in session just two blocks away, the lobby of the Doubletree by Hilton Tallahassee was buzzing with activity in early Feb. Jonathan LeBarre, the hotel’s director of sales, told me that many associations and corporate groups enjoy the close proximity to the Capitol, but sports groups also stay at the hotel due to many tournaments held in the area. 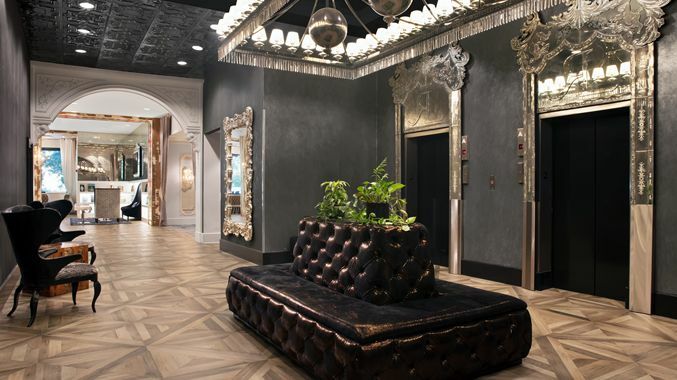 Even with all the activity, I could not miss the elaborate design of the hotel’s interior, where large chandeliers and ornate frames around the elevators contrasted with distressed wood ceilings and parquet floors. Along with LR monograms seen throughout the hotel, the design signifies the right and left of politics. The stylish lobby and a revamped entrance that has opened the hotel to the community around it is part of a three-year multimillion dollar renovation that includes the 10,600 square feet of meeting space. All 243 guest rooms are being revamped and I was fortunate to enjoy a renovated guest room that carried the whimsical theme of the lobby. Still to come are a redesigned restaurant and outdoor patio, which is a popular game day spot during athletic events at nearby Florida State University and Florida A&M University.